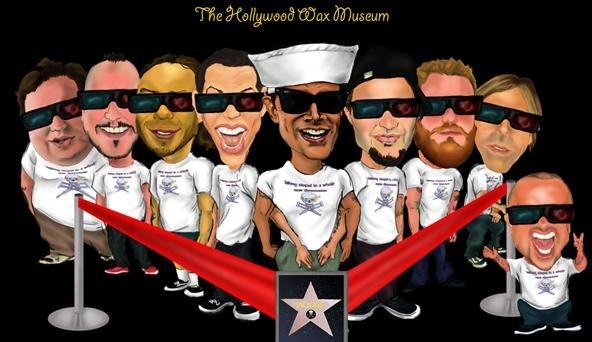 All 9 Jackass cast members individually purchase tickets to the wax museum. They dress down(hats, hoodies, sunnies, goat skin condoms, etc...) so that they are unrecognizable. Underneath whatever clothes chosen to disguise each member will be the custom 'Jackass 3D" t-shirt. Once everyone is inside the museum, regroup and position oneself in a manner that suits each individual cast members personality(peepee exposure is encouraged). Set up "Jackass crew" title display in front of cast(tinsel barriers too if desired). All of this can be done with aid from fellow Jackass crew members, if they decide to accompany any members into the museum. The 9 cast members then stand still as humanly possible, as if they were wax mannequins. To prevent exposed eye blinking to customers, 3d glasses will be worn. The museum does allow customers to take pictures of wax mannequins and also encourages them to touch, feel and pose with them. So no hands in front of the "thrill zone"!